Ideas for Teaching Better. All In One Place. So many ideas to share! Most of the blogs I write that get a good response are the ones about teaching. Thankfully. I’d write a book but a) it takes too much time b) the money is terrible and c) I’d just be repeating everything I’ve already written here. It would be called ‘Into the Rainforest of Teaching and Learning’. I like the organic metaphor because it captures something of the mystery, complexity and beauty of teaching well. This post is my very lazy outline for that book; another way of bringing some ideas together in one place. I like the idea that learning is ‘lush, diverse, unpredictable, evolving, daunting, exciting’. This is my underlying philosophy for teaching better: rainforest thinking. Update: In my current context, I increasingly feel that a ‘managed rainforest’ is a more appropriate metaphor and, actually autonomy should not override good collaborative team work where people work from a strong common curriculum and agreed principles. Can we have too much autonomy? 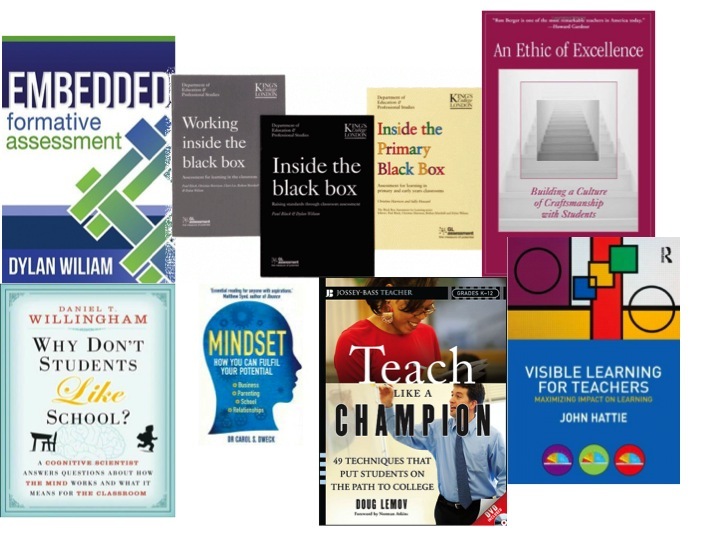 Although I’d change a few things, I’m still very happy with this series as a way to capture the essence of great lessons, especially the focus on habits rather than strategies. You can download a pdf with all the posts compiled together in one easy-to-share document. This collection of 20 posts covers an eclectic set of ideas some of which are quite practical; others more conceptual. There’s one post here that contains links to them all. I imagine that only a few people have read them all – but they are here to dip into rather than wade through. Principles of Effective Teaching – which links to lots of other lists but includes 12 ideas of my own, including Mode A and Mode B teaching. 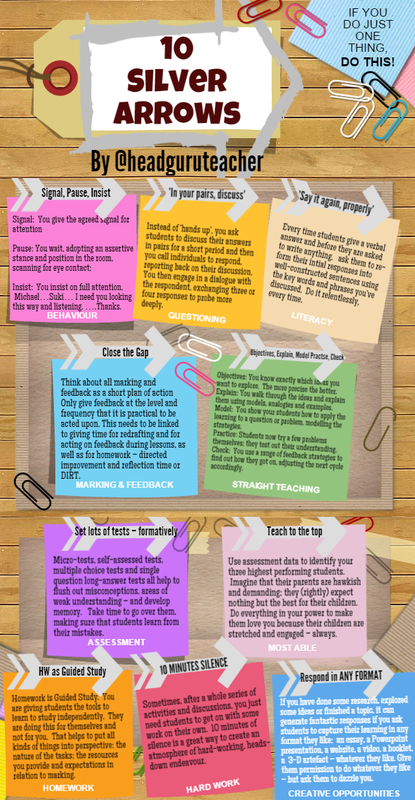 10 Teaching Essentials and 10 Teaching Pitfalls. Published on the same day these were neck and neck in the blog stats – but now Pitfalls has edged ahead. If you do just one thing, do this…. That was the idea. 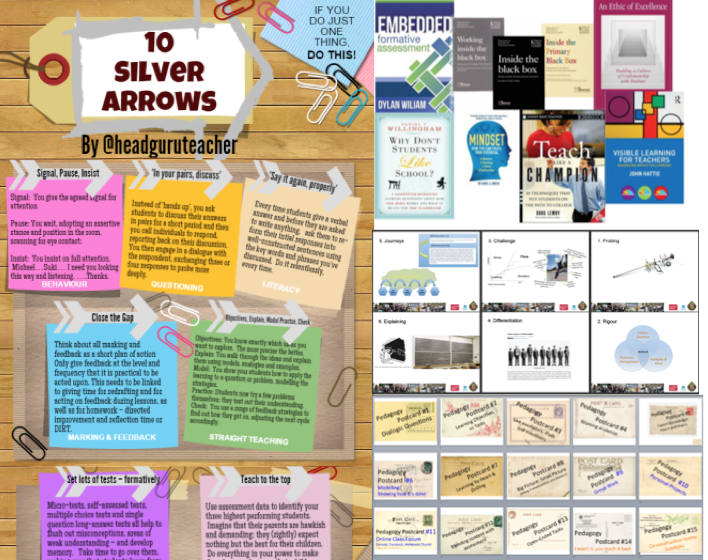 I had an amazing response to the Silver Arrows post helped along by @educatingmiss who made the infographic. Sometimes, it helps to distil ideas down to something tangible and specific that you can actually do. Think Pair Share: It’s true that this is the feedback I give most often after lesson observations – to try more of this. 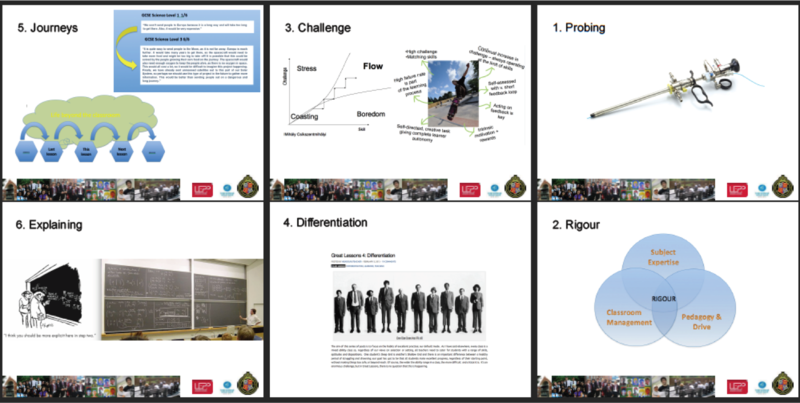 10 Teaching techniques to practise – deliberately: A blog setting out some specific teaching techniques that can be isolated for deliberate practice. By deciding to focus on one particular strategy and working on it systematically, I’m suggesting that teachers can significantly improve their practice. Behaviour: For completeness, here is the Bill Rogers Top 10 post that gets 100 hits a day via google searches for Behaviour Management. Bill’s approach is brilliant, especially in the context of a good school system. Marking: I’ve got two posts on this subject. Close the Gap – is all about acting on feedback, using the approach used at Saffron Walden High School; it also has a fab sheet of ideas for reducing workload. The other is about keeping marking in perspective – doing the amount of marking that has impact but no more. This post suggests a more radical approach – Rethinking Marking and feedback; it’s all about the response. Planning: I think we should focus less on individual lessons, more on planning a lesson sequence. I also find that the Learning Arc is a helpful concept – learning takes the time it takes. Differentiation: Some people find this idea problematic because it can lead to lowering expectations. That is true. At the same time, we need to face the fact that different students have differing needs. In this post I use another organic analogy – gardening. Day-to-day differentiation is like tending to a garden, paying attention to individual specimens at the right time, doing the best you can. In this post, I’ve linked to lots of videos of key people sharing their ideas: Contemporary Educational Ideas All My Staff Should Know About. Here, I’m sharing thoughts about how to engage with different types of research. Ideas in Practice: In my imagined book, I have lots of examples of the ideas in practice. 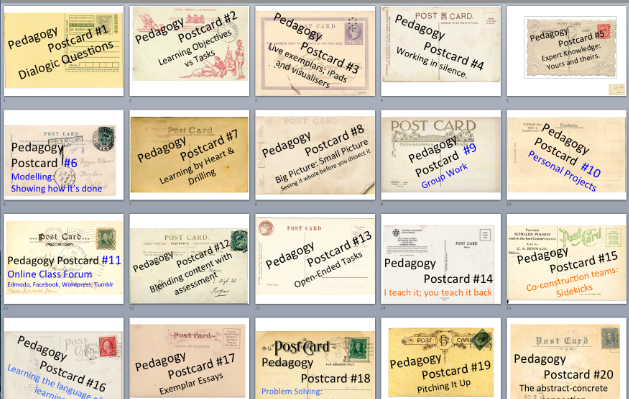 Some of these are captured in my recent review of teaching and learning at Highbury Grove – 90 Lessons – in addition to the many KEGS references throughout all the posts above. Presentation and Redrafting. It is worth revisiting the Austin’s Butterfly video and use redrafting video to improve the basics of presentation. I also think that a focus on presentation can be a vehicle for addressing wider learning issues under the guise of simply making it more clear, accurate and precise. 12 Steps to a ‘Great Teacher’ reputation – possibly a bit preachy in places but real enough. Advice for getting a job – interviews and applications. Managing workload – pressing the reset button from time to time. And finally, a return to the Rainforest metaphor: Creating the Conditions for Great Teachers to Thrive. Very finally, I want to reinforce the importance of seeking to improve continually. In my most recent post, I’ve reflected on my personal pedagogical to-do list. It changes every year. It’s what keeps me going more than anything. Thanks for reading. This post is dedicated to every teacher I’ve worked with, observed and borrowed ideas from and everyone who has read and commented on these blog posts. If anyone wants to volunteer to turn this into a book for me – please let me know! I’ve hit the mother load! Thanks! I agree! This is a helpful overview. I have positive outlook of this, thank you!